In Rainham there was originally a Tesco store in the Rainham precinct but in 1994 a much larger store was opened on the Bowaters site at Rainham Mark. This has become a Tesco Extra in the late 2000s. When the Tesco store opened at Bowaters there were concerns that it would mean the demise of the central store in Rainham so Tesco were required to guarantee that it would remain open for a period of time. This has now long expired but the store in Rainham Shopping centre is now badged as a Tesco Metro and trades on convenience and location. As a result of the 2 stores in such close proximity there is a local naming convention with Big Tesco and Little Tesco - the Tesco Extra is known as the Big Tesco. 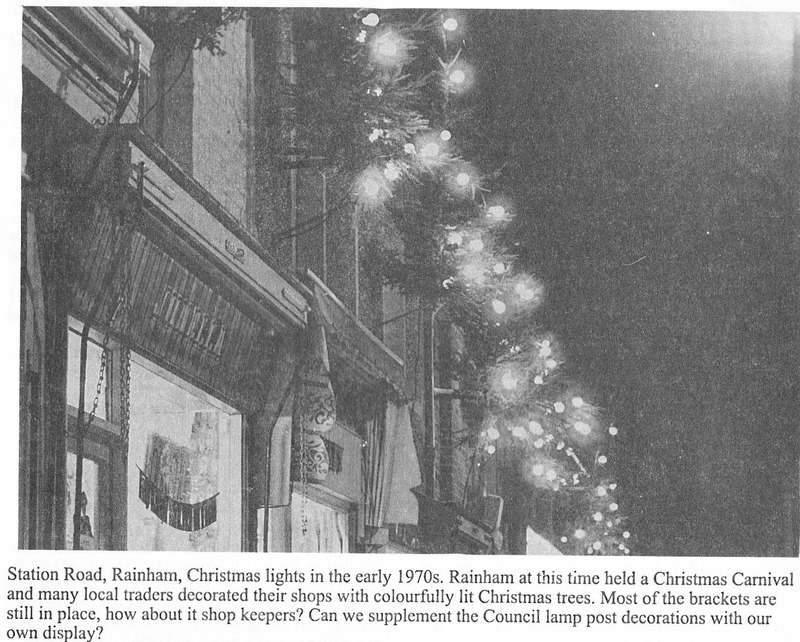 Back in the 1970s many shops in Station Road had Christmas lights as shown in the photo below. These were often held up with permanent brackets fixed to the walls and many of these brackets are still in place if you have a look at the first floor level of shops down the road. Many of the brackets consisted of 3 metal legs bolted to the walls as can be seen in the photos below. In the photo below you can see the metal frame for the light stands above the Phipps Anthony sign between the 2 upper windows. In the next photo below the frame is to the right of the Maltbys sign and again consists of 3 iron legs bolted to the wall. 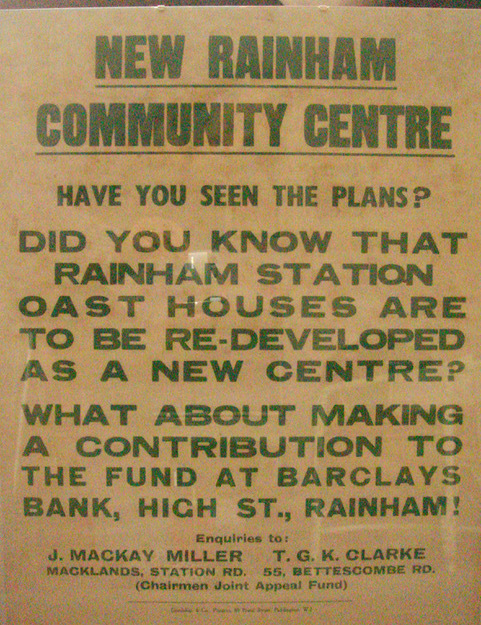 Back in 1972 plans were being drawn up for a new community centre in Rainham. The old community centre was at the top of Station Road in the former school but this was being demolished for the new Rainham precinct shopping centre. 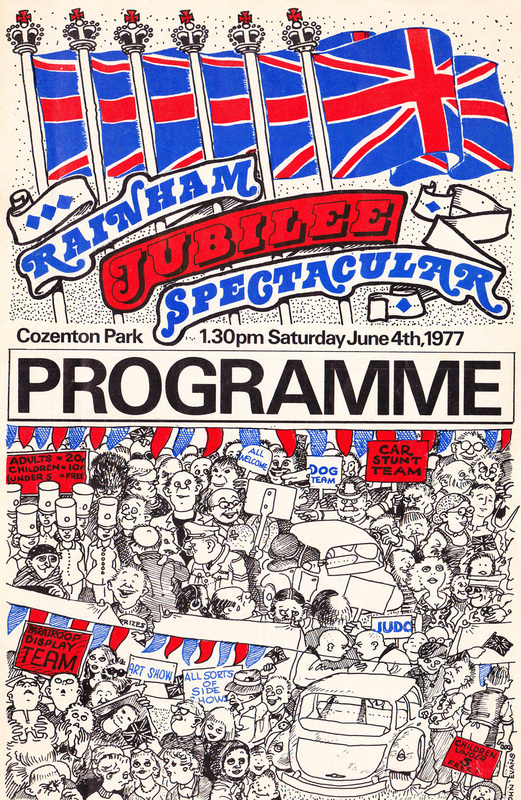 Thanks to David Alcock who sent a selection of programmes for the Rainham Spectacular fair at Cozenton Park it's possible to get a glimpse into life and the businesses of 1970s Rainham. 1977 was the Queen's Silver Jubilee and the programme had a patriotic Jubilee theme to it with union jack flags adorning the cover. The event took place on Saturday 4th June 1977. Some of the businesses represented by their adverts in the programme were Sophisti-Cats, Woolcraft, Hayfield Builders, The Old House Restaurant Lower Rainham Road (subsequently The Barn? ), Poultons, Greens Garage, Pat and Parkwood Service Station.